Burlington High School Principal's Blog: Did That Police Officer Just Give Me A Chicken Sandwich? Thanks Chick-fil-A! Did That Police Officer Just Give Me A Chicken Sandwich? Thanks Chick-fil-A! Did That Police Officer Just Give Me A Chicken Sandwich? The quick answer is yes, but let me explain. The members of the Traffic Division attempt to be visible around town as much as possible. One of our key locations is at the high school. 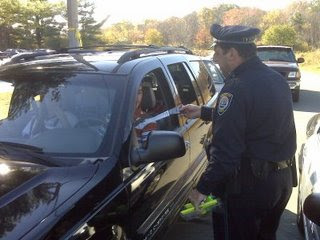 As time permits we try to be at the exit of the student parking lot to remind students to be properly buckled. Sometimes we even have a token for them, a reward for buckling up. In the Traffic Safety world this is known as "positive enforcement." When we were there in October, we handed out Ice scrapers, mouse pads and BPD pens. In passing one student jokingly asked "What, no food?" Well, you guessed it. This past Monday as students were exiting the parking lot they were given a hot chicken sandwich...if they were buckled up. One by one as cars exited, members of the Traffic Division conversed with the students about seatbelt safety while the school administration officials looked on and provided support. The students laughed, joked and couldn't believe that we were handing out sandwiches and not tickets. Nearby the police department's variable message board displayed the message Don't Be Chicken, Buckle Up. A program like this would not be possible for the police department to do alone and we would like to thank Chick-fil-A of the Burlington Mall for generously donating 250 hot chicken sandwiches and the administration of Burlington High School. We value their partnerships and know that programs like this work by reminding teens that they need to be buckled up every trip, no matter how short the ride.